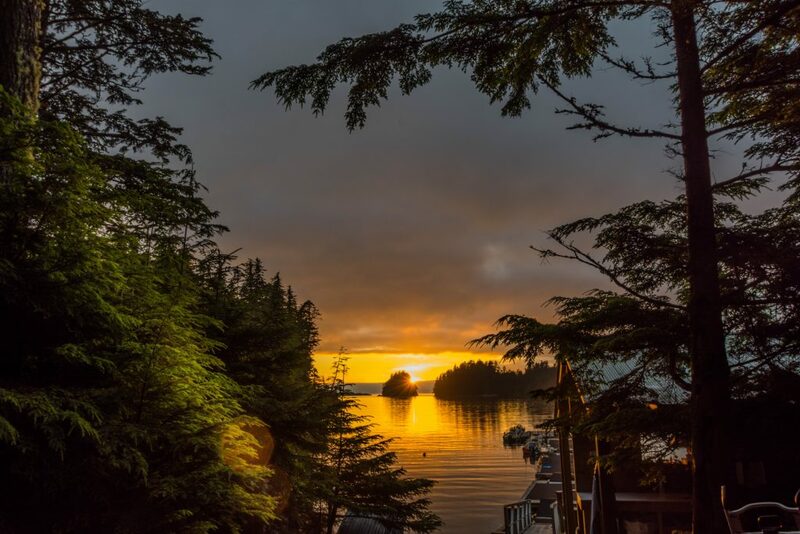 2016 was another season in which The West Coast Fishing Club offered the pinnacle of comfort, service and safety to over 2,250 guests at lodges that operated at full capacity from opening day on May 29 to closing day on September 14. 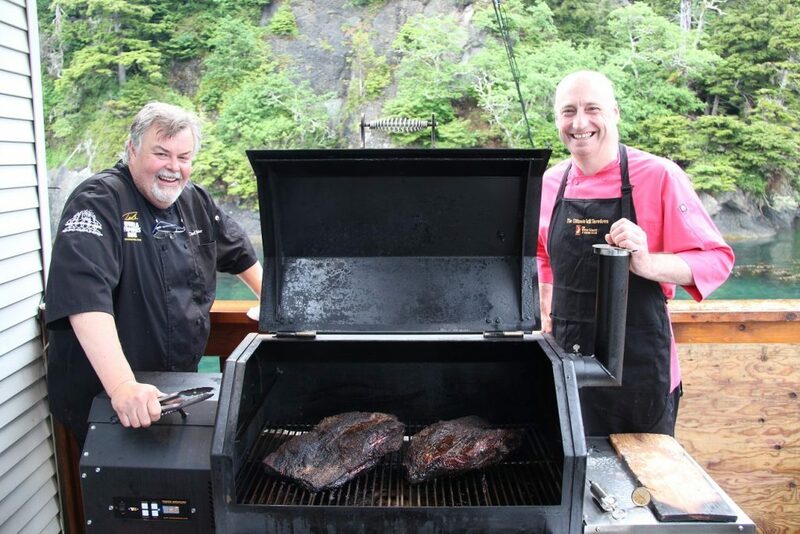 In addition, two new special culinary events spiced up the calendar and reinforced our reputation for offering the highest standards within BC’s sport fishing industry. 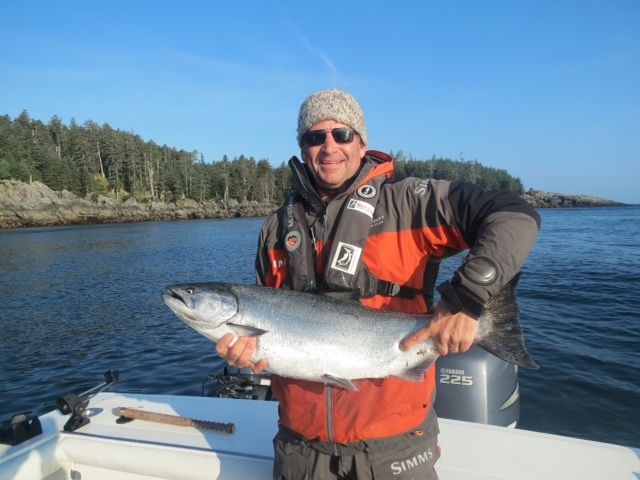 And while the fishing was a bit slow at times throughout the BC coast, Haida Gwaii was again the place to maximize chances of catching ample numbers of Salmon and Halibut. 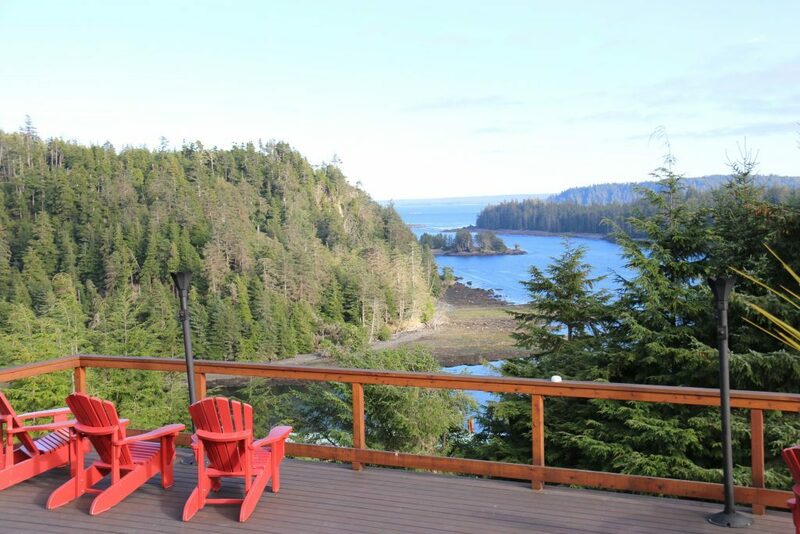 Judging by what we saw in hundreds of comment cards, our guests were more than satisfied with their marine wilderness adventures at all three lodges. * Orcas a very common sighting in 2016. * Beautiful Eagle in flight. 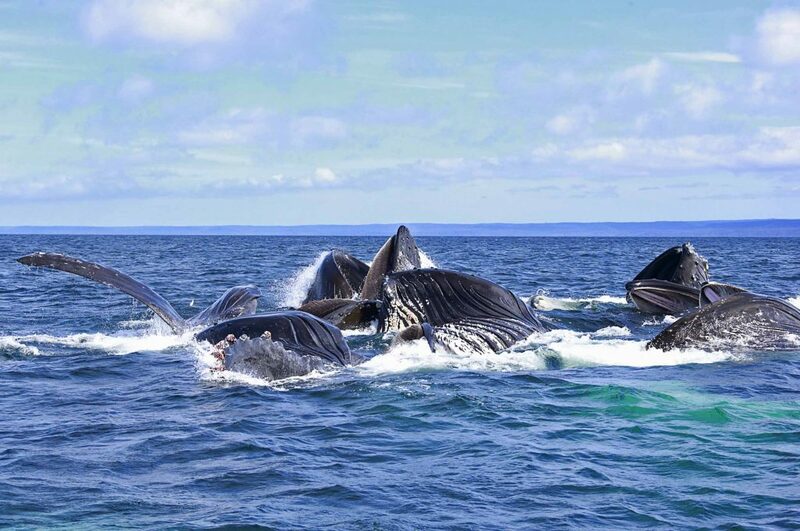 * Humpback whales playing in the sun. Once again the season began with the Short Notice Club Derby at The Clubhouse. While all three top entries topped 30 pounds, it was Anthony Delatolla who boated a 32 on day two of the tourney to clinch first place and the top prize of a return trip later in the season. 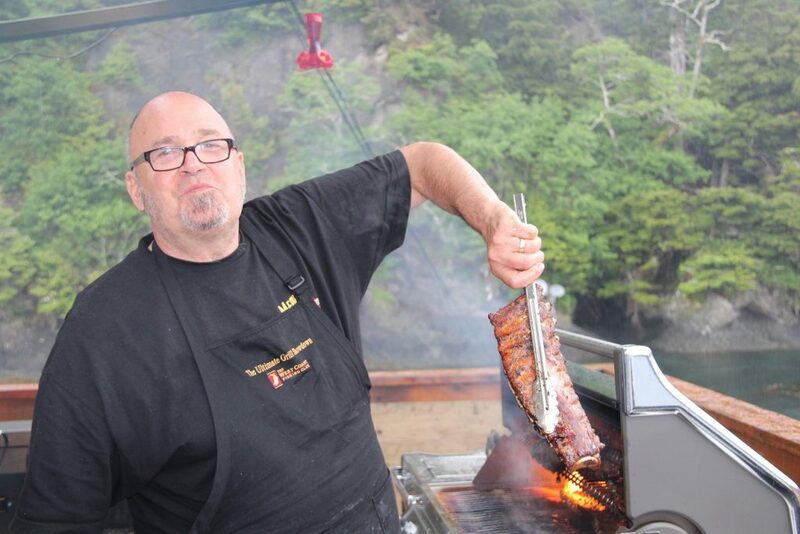 Meanwhile at North Island Lodge the season opened with the second annual Ultimate Grill Showdown, a barbeque extravaganza that featured a return appearance by Ted Reader, Canada’s own Godfather of the Grill; his transatlantic counterpart Andy Annat of Yorkshire England, along with Park and Charmaine Heffelfinger, owners of Memphis Blues Barbeque House restaurants. 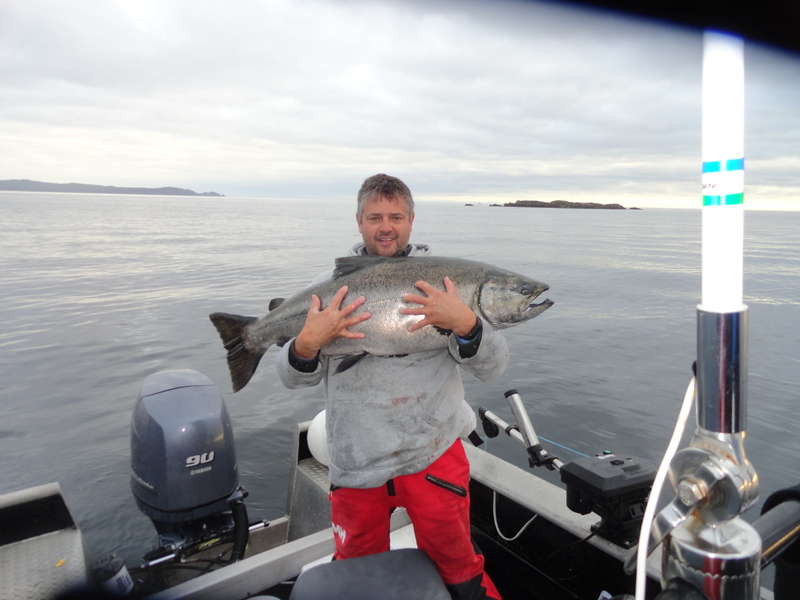 On the following trip Rob Brett grabbed the first Tyee of the season for North Island Lodge, a 34 off Gunia Point. 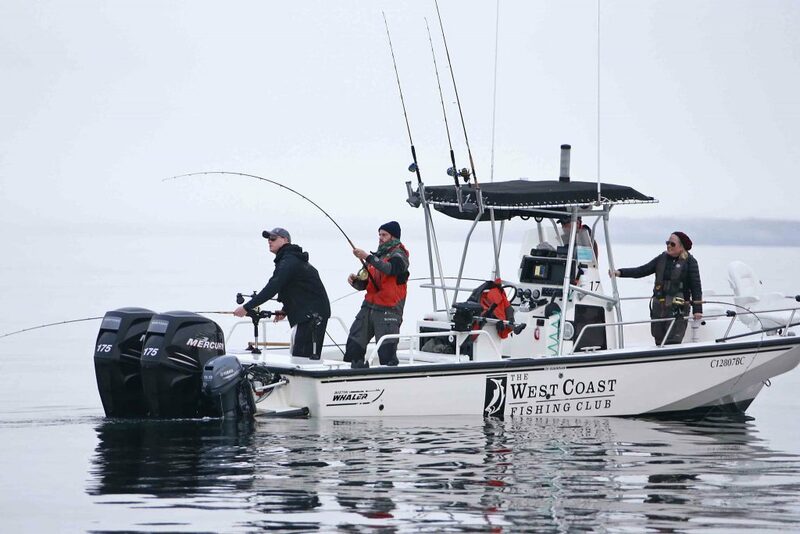 Guests at both The Clubhouse and North Island Lodge also enjoyed stellar Halibut fishing right out of the gate this year, with many picking up 18 to 60 pounders while trolling for Salmon, and not just out west where the larger fish tend to congregate but also off McPherson and Cohoe Point. * Ted Reader and a 60lb Halibut caught off Cohoe Point. * Park Heffelfinger taking the baby back ribs off the flaming Napoleon grill. 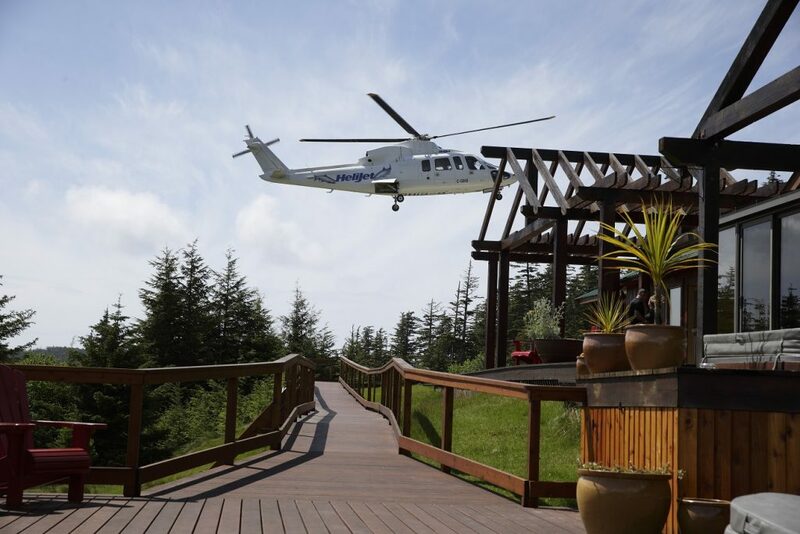 The following week saw the first guests of The Outpost touch down in Port Louis, where full totes of Salmon and Halibut were the norm throughout the month of June as guests routinely doubled up in many places close to the lodge, including Three Rocks, Tian Head and Fish-hook. 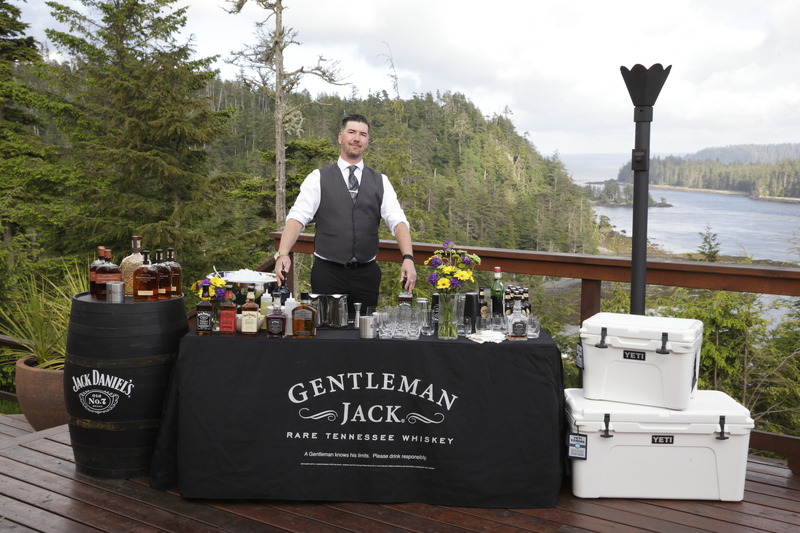 June also saw the inaugural Back Deck Bourbon Barbeque play to a sell-out crowd at The Clubhouse. 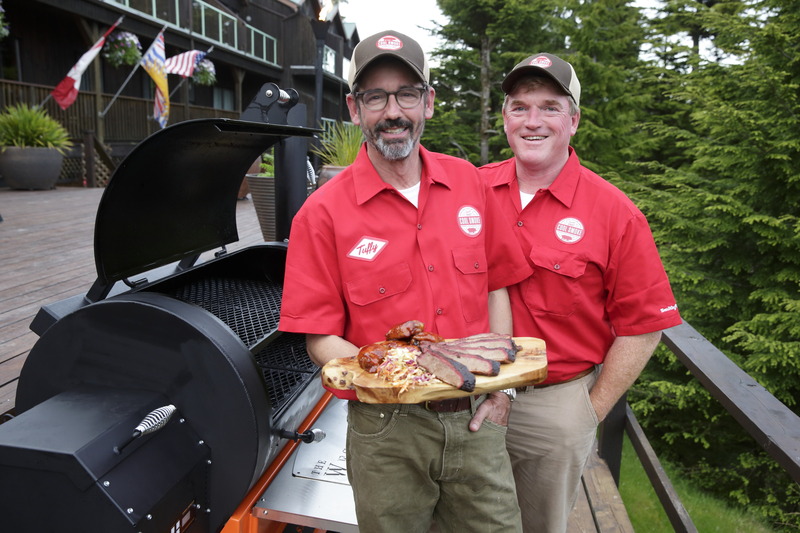 Following on the success of the Ultimate Grill Showdown, the new event featured southern barbeque cuisine courtesy of world-renowned pit-master Tuffy Stone, combined with the finest from the Jack Daniel’s family of whiskies. Then one day in mid-June Todd Gardiner put in a memorable afternoon shift off Lacy Island with The Clubhouse head guide Mike Tonnesen (Screamer) and produced the first plus-40 fish of the season, a meaty 45 pounds according to measurement of girth and length before a clean release. 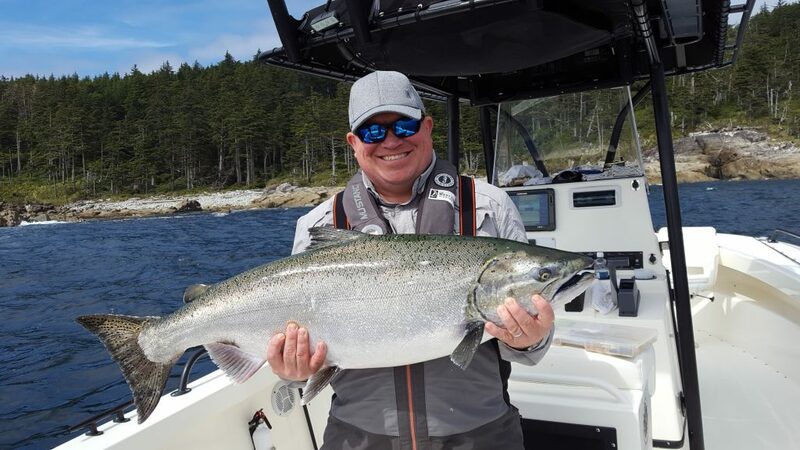 Round about that same time North Island Lodge guest Vic Tuinenga picked up the first plus-40 fish for North Island Lodge, a 42 caught and released in Bruin Bay with guide Kyle Alton. 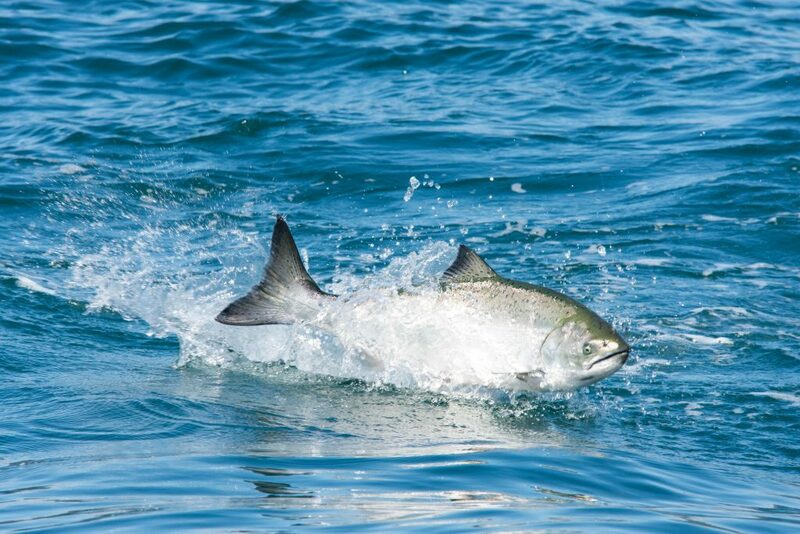 And, as commonly occurs, Coho Salmon began showing up in greater numbers towards the latter part of June at Port Louis and Langara Island. * Stunning Port Louis, home to The Outpost. * Todd Gardner’s 45lb release. 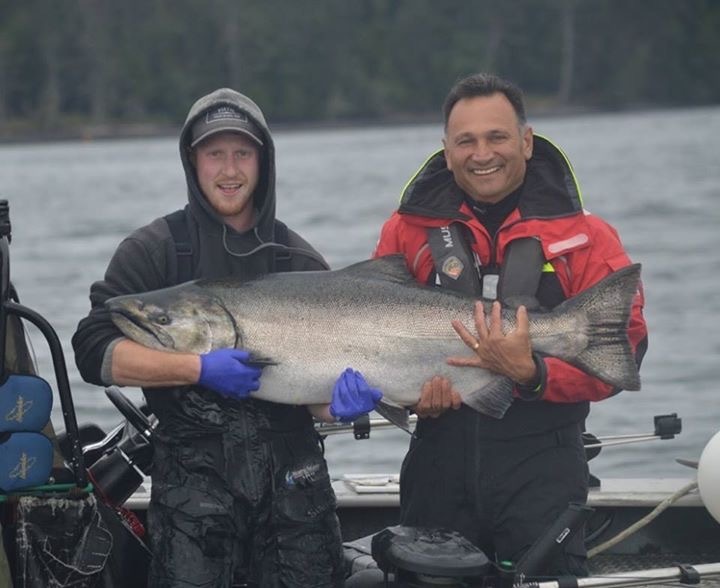 * Vic Tuinenga with guide Kyle Alton and a 42lb Tyee. * Jack Daniels Brand Ambassador Gerry Jobe ready to serve up some Bourbon at the Back Deck Bourbon Barbeque. 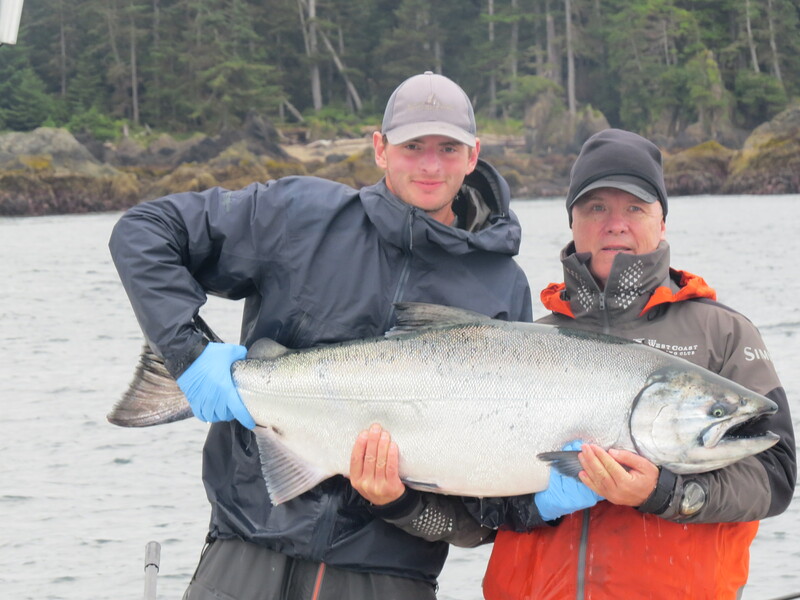 * Guide Kyle Alton with Michael Morris’ 30lb Tyee. *Jeff Hayes and Jacob Richler enjoy a double header while guide Steve Tennant looks on. 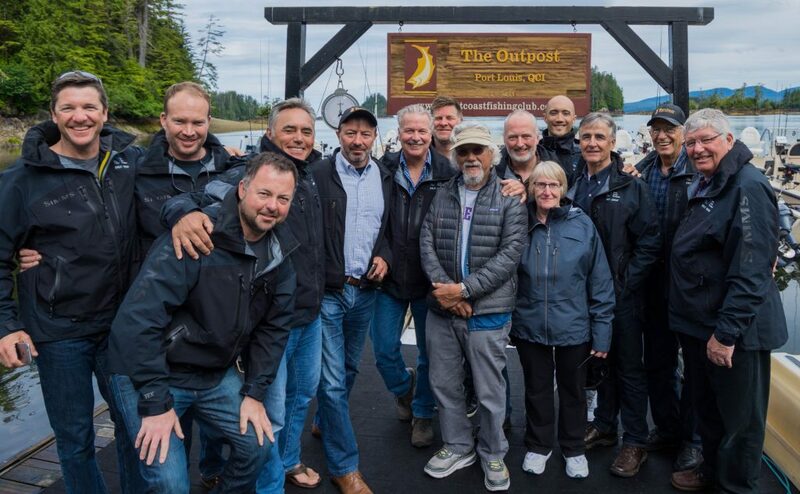 On the first week of July The Outpost had a distinguished visitor in the person of Dr. David Suzuki, globally renowned environmentalist and the long-time host of CBC TV’s The Nature of Things. 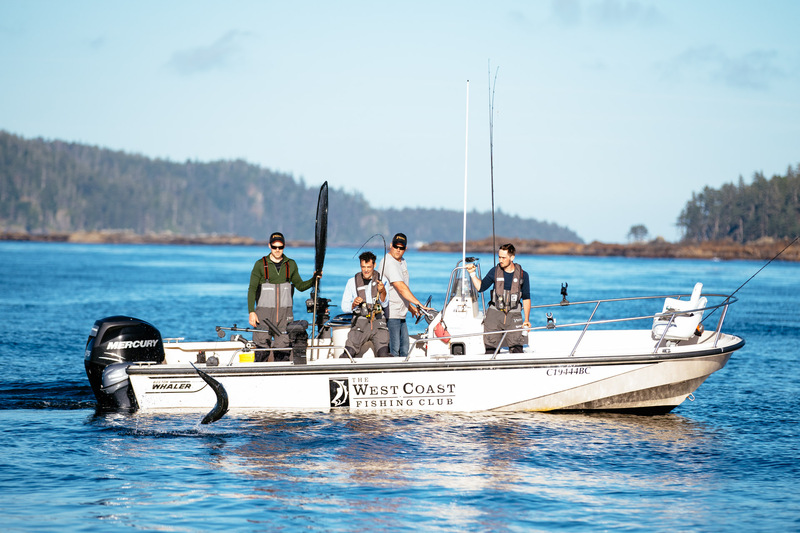 While celebrity guests are not uncommon for The West Coast Fishing Club, this one took on some extra significance in that it hopefully helps to underscore The Club’s deep commitment to sustainability in all of its operations, including conservation-minded angling. 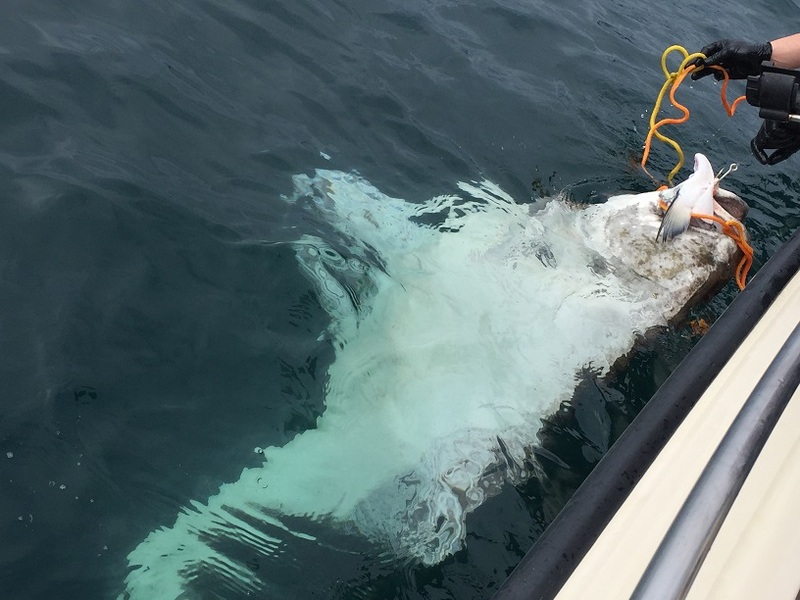 In July at Port Louis, guests had no trouble finding perfect sized take-home Halibut of 50-60 pounds, and many that went considerably larger, like the one angled by Scott Fox that was estimated to have been 440 pounds based on a length of seven and a half feet! 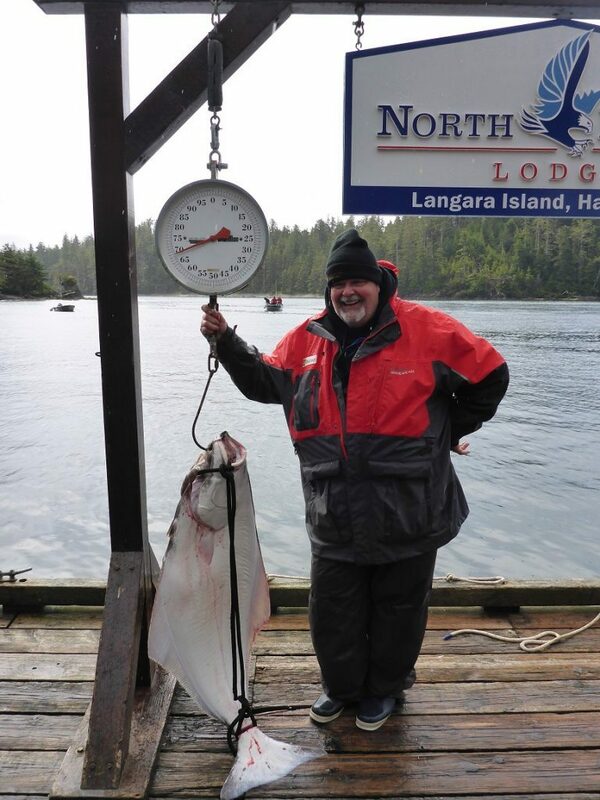 A couple of weeks later Jim Denny angled two monster Halibut on one afternoon of about 300 and 435 lbs. * The Delta Land group with featured guest David Suzuki at The Outpost. 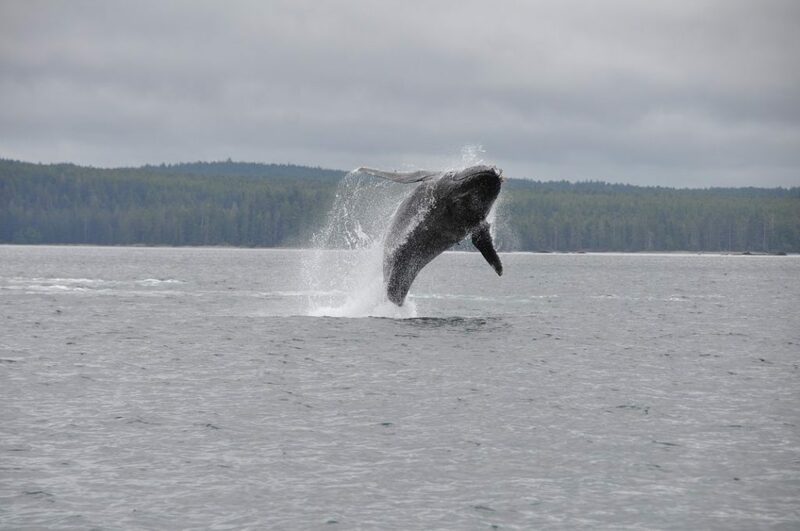 * Humpback putting on a whale of a show. 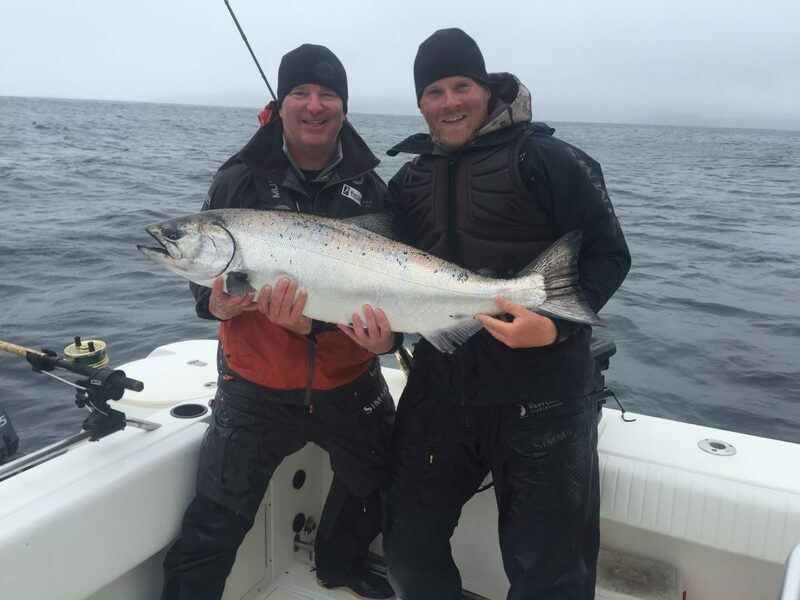 By the third week in July a new mark had been set for the biggest Salmon of the year for The Club, a 58-pound prize hog that was caught and released by David Bickford and guide Brent Gallacher of The Clubhouse. 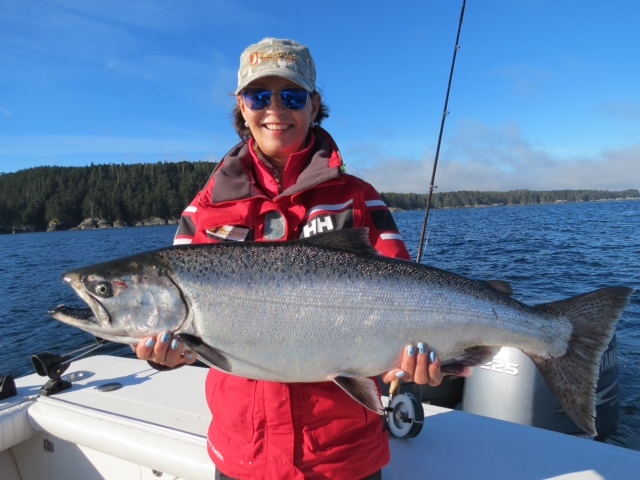 Less than a week later, North Island Lodge guest Gaby Mirza rang the bell on a similar-sized slab of flesh and bone, thanks to the guiding of Pat Davies, who carefully measured the fish at 49 by 30 inches – 55 pounds – before letting her go unharmed. 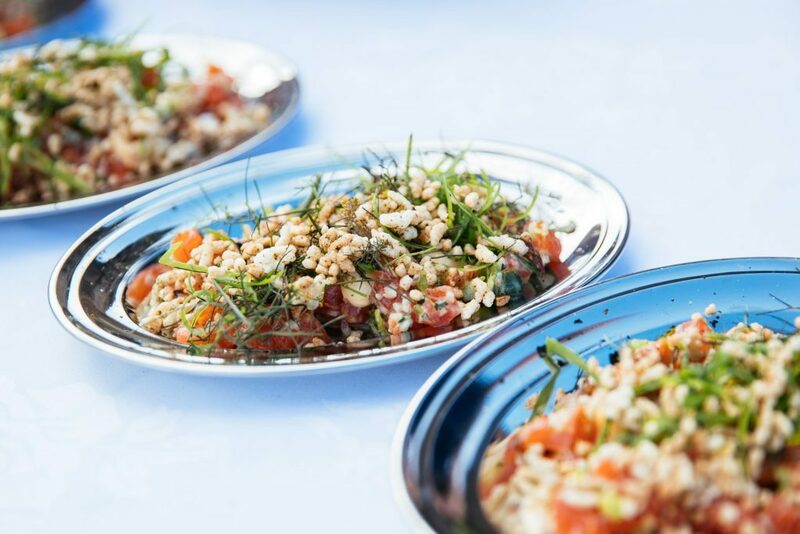 A sold-out crowd assembled at The Clubhouse July 17-21 and reveled both noon and night at the 10th annual David Hawksworth & Friends Culinary Adventure, featuring celebrity guest chefs Normand Laprise, Valentine Warner, Derek Dammann and Dino Renaerts, along with sommelier Mark Davidson. Chef Hawksworth prepared dinner on the closing night and, as always, the event attracted a number of women anglers eager to unleash their inner chef between sessions on the water, including Ina Long who caught and released a 40 to earn a coveted WCFC Tyee pin, Michele Dunkerley, who connected with a double – a 33.5 and a 30.5 – both released, and Linda Zulinick who picked up a 34. * Derek Dammann serving hungry guests. 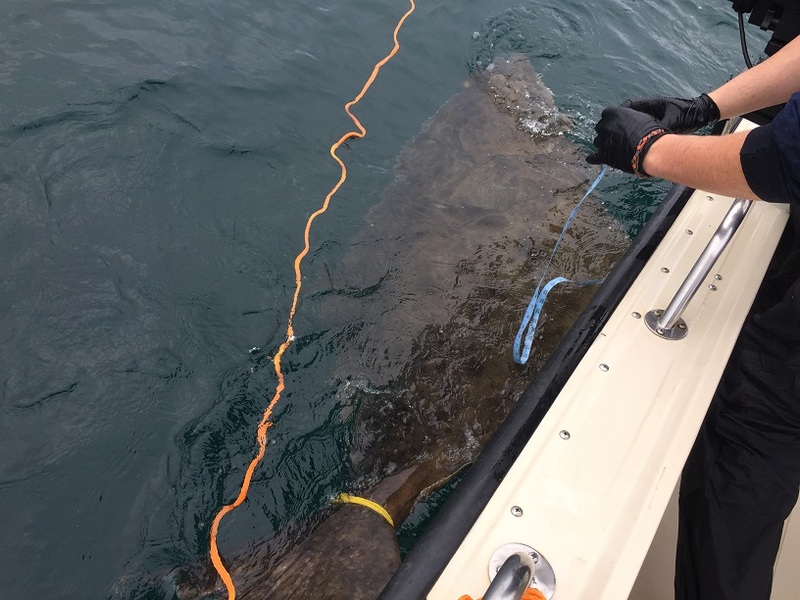 The trend towards larger fish continued into the latter part of July, exemplified by 20 Tyees caught between July 21 and 27 at The Clubhouse alone. 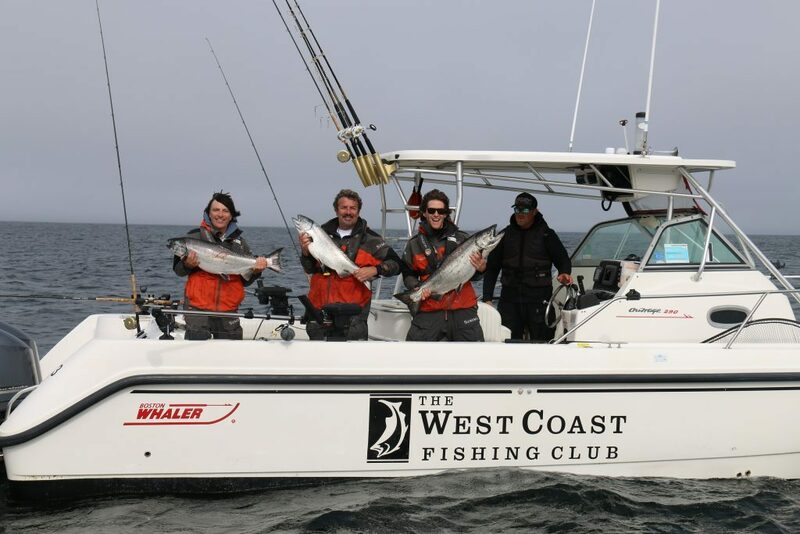 Of these, five topped 40 pounds, including a 46 taken by former PGA golf legend Dave Stockton Sr. who was back for his annual fishing fix with The West Coast Fishing Club. But the 11-time PGA tournament winner finished tied with David McKibbon for second place on the leader board on that trip, as Mark Yragui took top fish of the week with a 48. 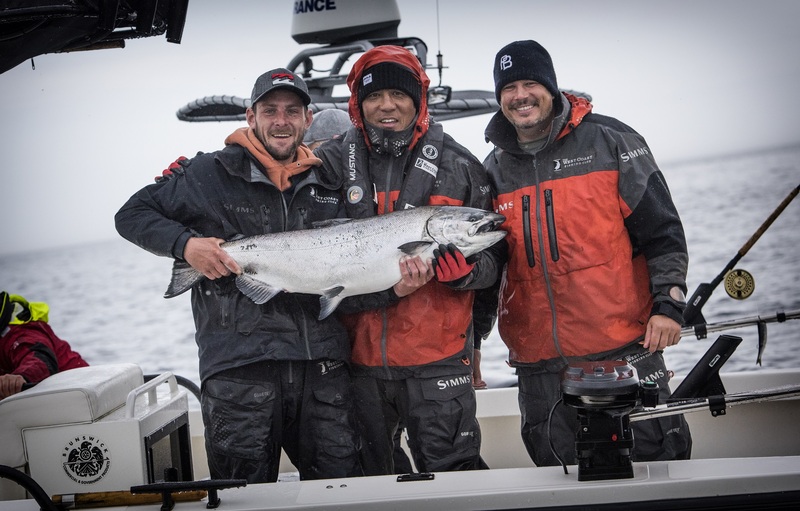 * Dave Stockton Sr, guide Bryce, and Dave Stockton Jr celebrating the 46lb Tyee! 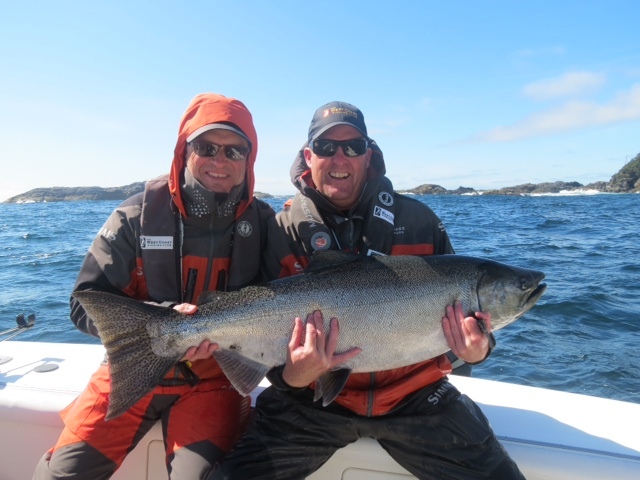 * David McKibbon with guide Matt Conelley and a 46lb Tyee. *Mikee Johnson and his 43lb Tyee. 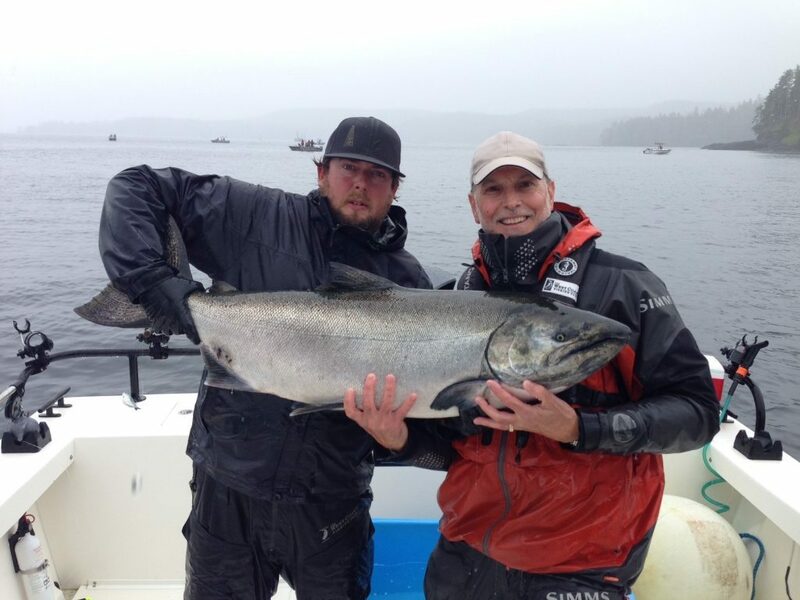 * Todd Craigen and guide Steve Tennant with a 39lb Tyee. 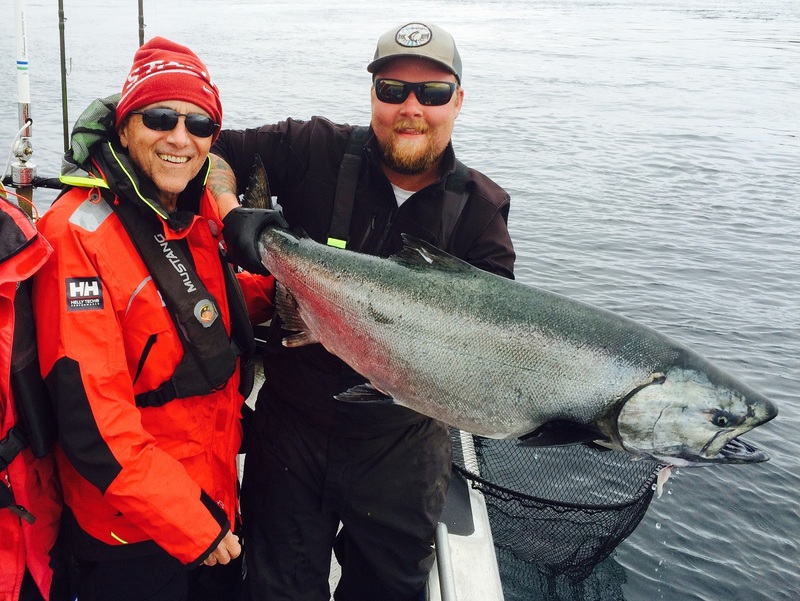 The Tyee train continued as August began. With just two weeks to go in the season at The Outpost, Paul Sczeny and guide Bradan James set a new season-high for Port Louis with a 46 angled at Fish-hook. 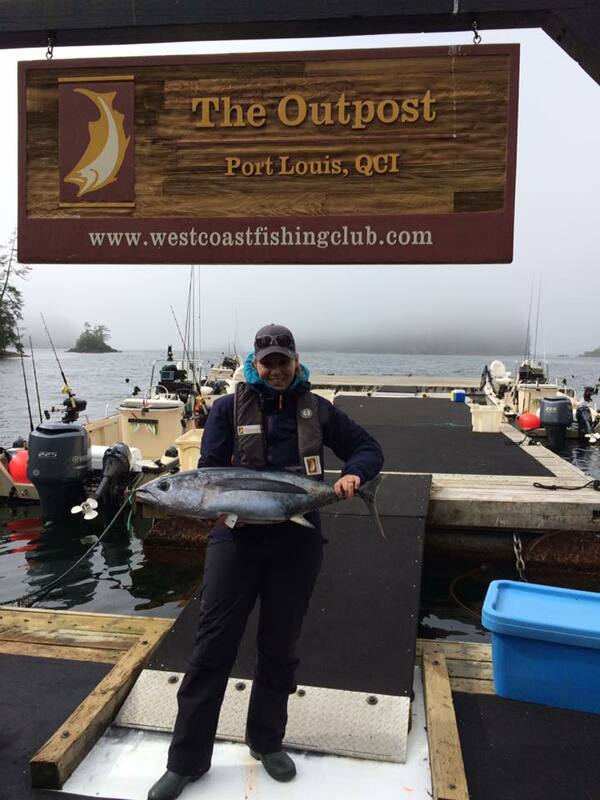 On the Coho front, a new mark of 17 pounds was set at The Outpost by Bernie Simpson, but held for only a day before being taken over by Carson Tofin who beat that by a pound. 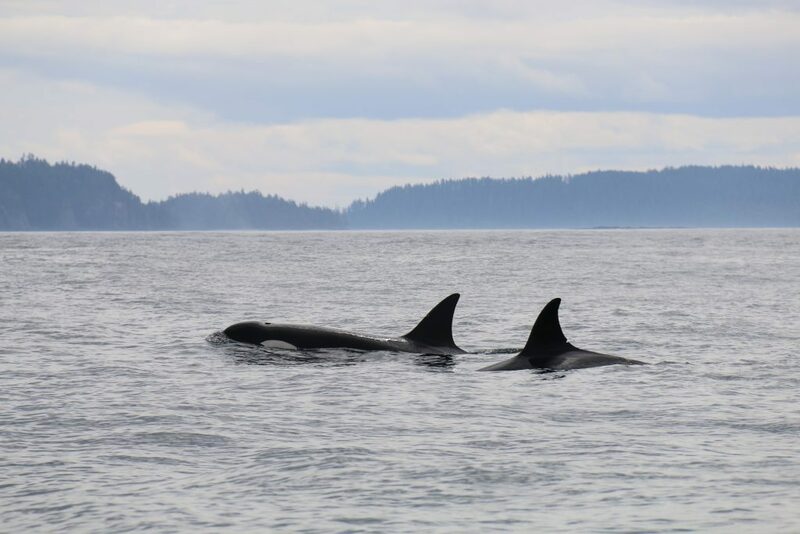 At about the same time a fresh new wave of Tyees appeared to arrive at Langara Island, including another 46 that was hooked and released by Gilles Berube. Bill Strand later did something nobody has else did all year and that was catch two Chinook Salmon in the plus-forty range, a 43 and a 42, both released. 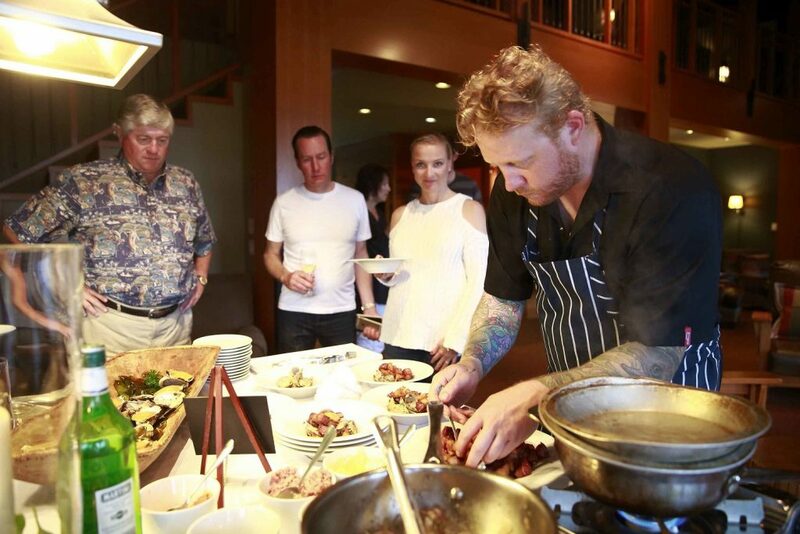 There was also a bit more action on the celebrity watch in the latter days of summer as country music superstar and actress Reba McEntire blended in with the faithful fishers gathered at The Clubhouse, along with her son Shelby Blackstock, an Indy Light race car driver on the Andretti Autosports team. 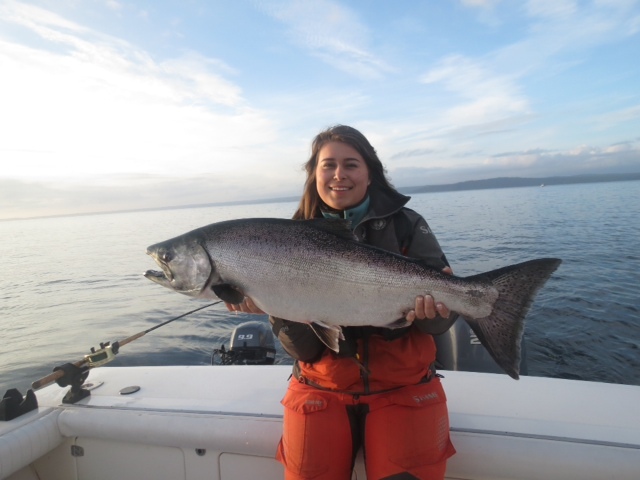 * Kelly Elliott and her 32lb Tyee caught on the West Bank. 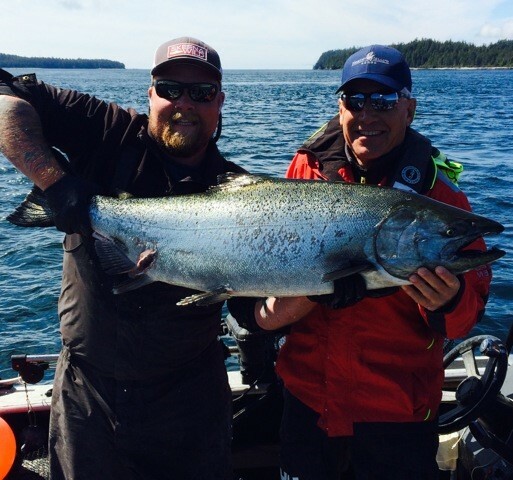 * Pat Elliott releasing a nice Chinook on the east side in gorgeous conditions. * Reba McEntire and son Shelby Blackstock with a nice take home fish on a sunny day. 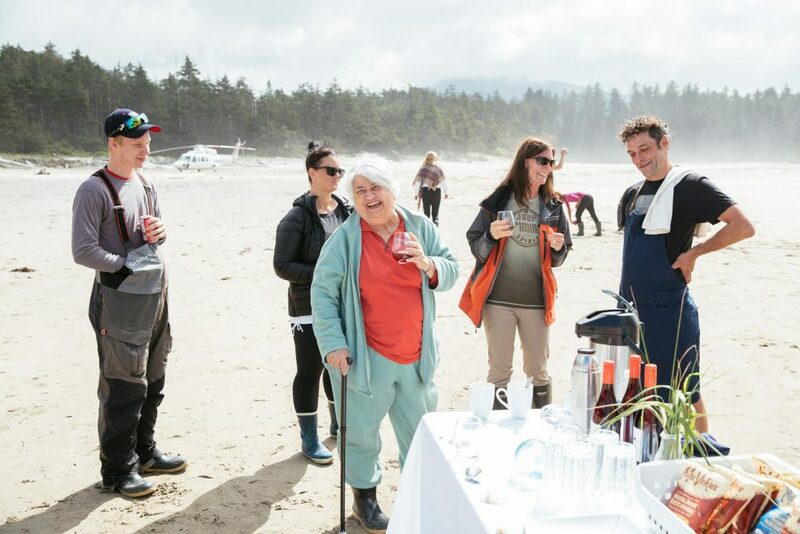 Next up on the special events calendar was the inaugural Coastal Culinary Experience, a new gastronomic odyssey that, among other highlights, sent guests to a deserted beach on Beresford Bay where they dined el fresco on a long list of menu items that ranged from marinated Salmon salad served on Korean rice crisps to sea snails with chanterelles and fennel to 12-hour braised beef with strawberry and matsutake mushrooms. Special guest Chef Charles-Antoine Crête, former right hand man to Normand Laprise and now Chef and Owner of recently opened Montreal Plaza, was on hand to oversee the food preparation with his sous chef Simon McConnell-Enright. 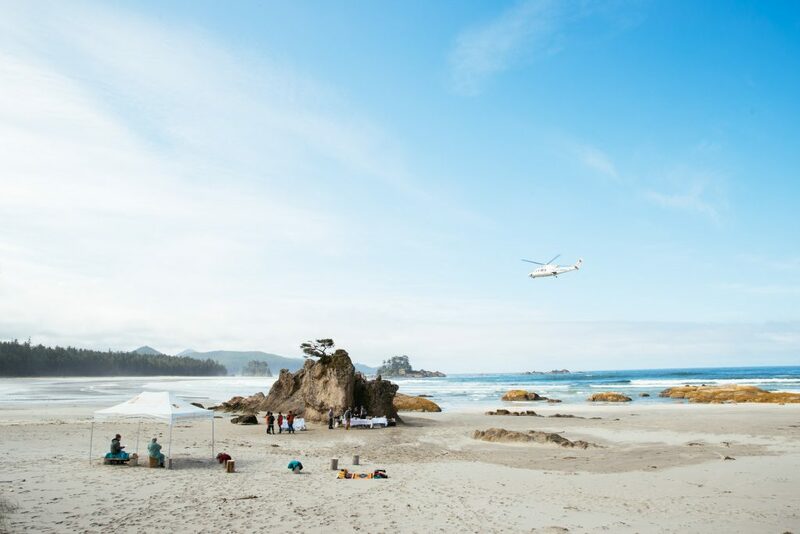 So unique and ideal was the marine wilderness setting that the guests lingered long after, beachcombing and sipping wine under sunny skies. * The stage for the Coastal Culinary Experience on remote Beresford Bay. * Guests beginning to arrive. 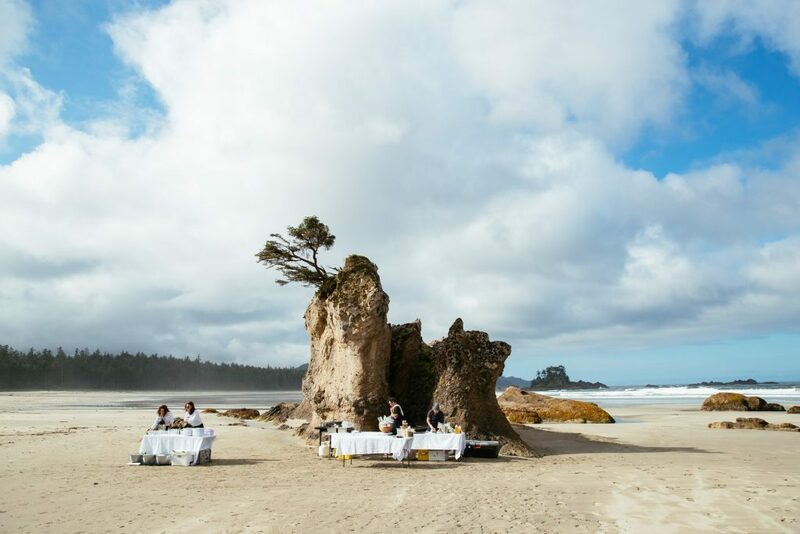 * An absolutely stunning location for a beach lunch. 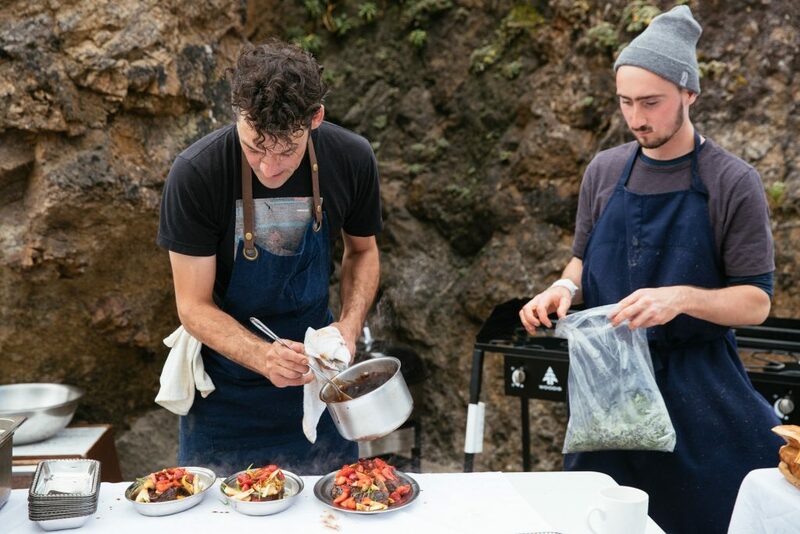 * Chef Charles and Chef Simon working away plating the 12 hour braised beef. * Guests enjoying a beautiful day and a couple laughs with Chef Charles. 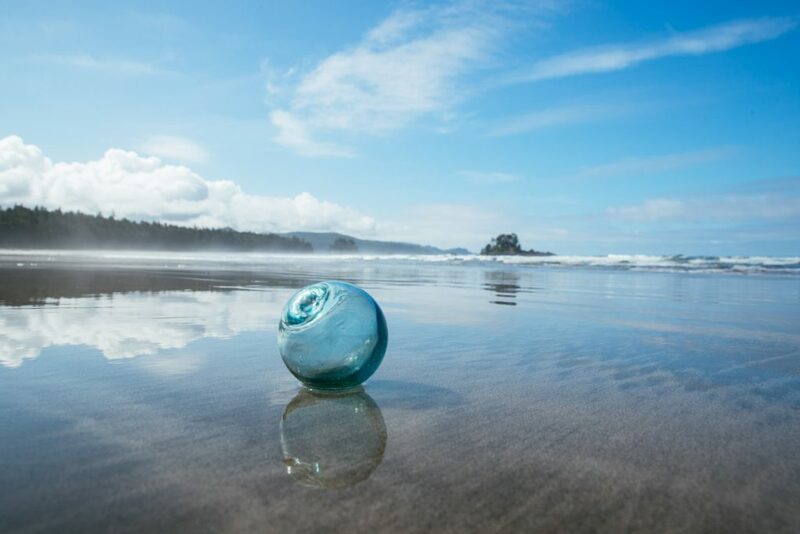 * Glass ball that one of our lucky guests found. 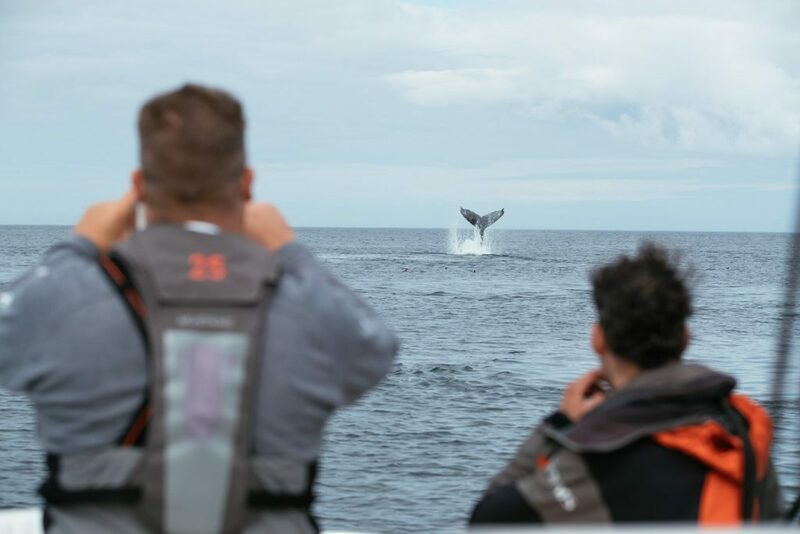 * Whale watching at it’s finest. 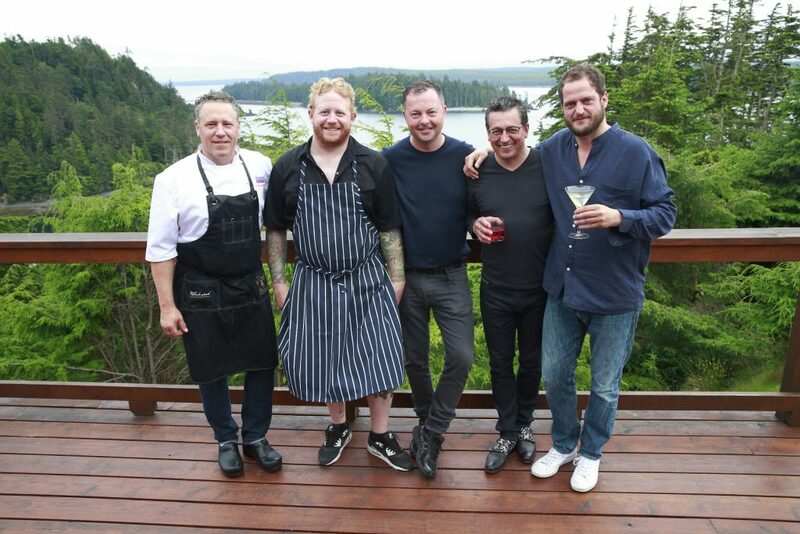 * Fish on for Chef Charles and crew. The following week saw the last trip of the year for The Outpost, but a normal trip it most certainly was not. 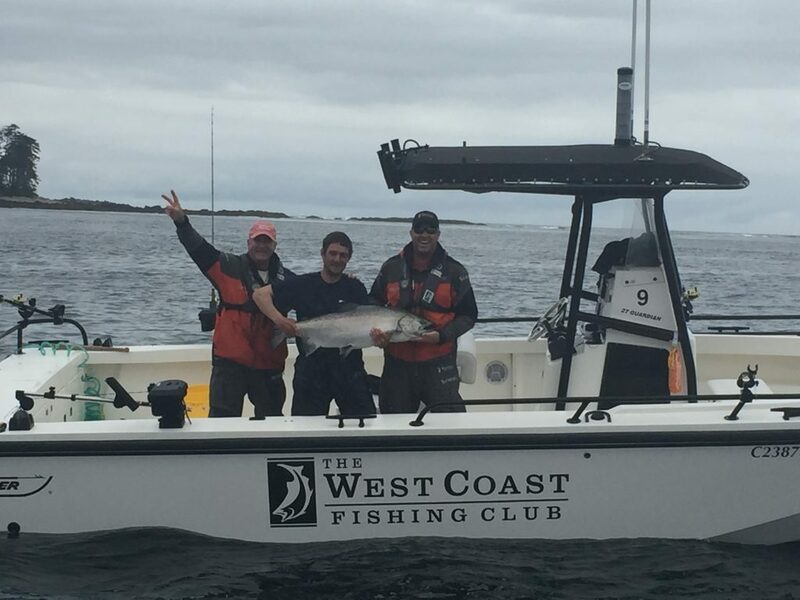 That final group, which coincidentally included West Coast Fishing Club co-founders Rick Grange and Brian Legge, headed out on calm waters to a point two hours offshore where they landed 30 Albacore Tuna between 15 and 28 pounds. Now that’s the way to end another glorious summer at Port Louis! 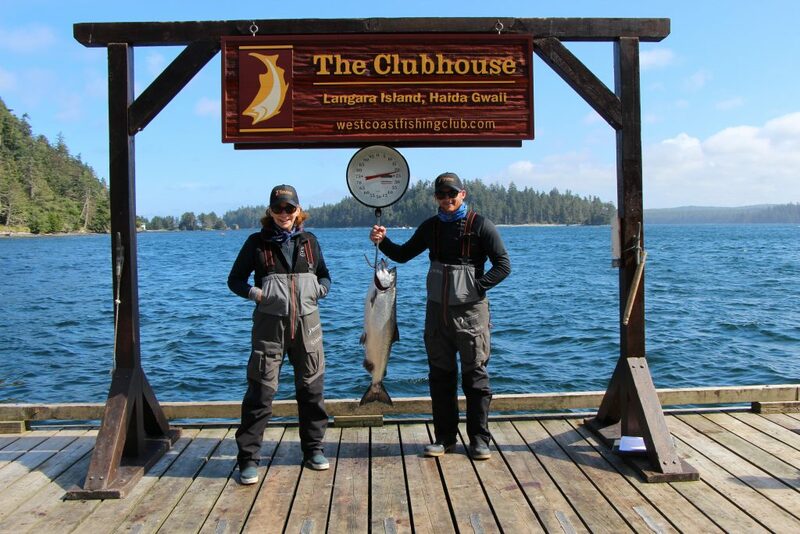 Meanwhile up at Langara Island, the same period saw a total of 11 Tyees at The Clubhouse alone, including a 43 for Lindsay Garske, who along with her sisters Lauren and Mckenna recently began accompanying their father Greg on his annual fishing trips. * Chef Stephanie Noel posing with a Tuna after a successful offshore adventure. 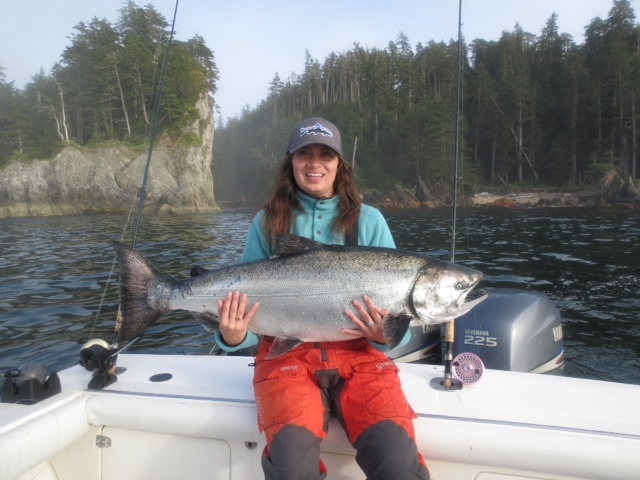 *Lindsay Garske with her monster Chinook, a Tyee of some 43 lbs. * Mid twenties Chinook for the Garske girls. 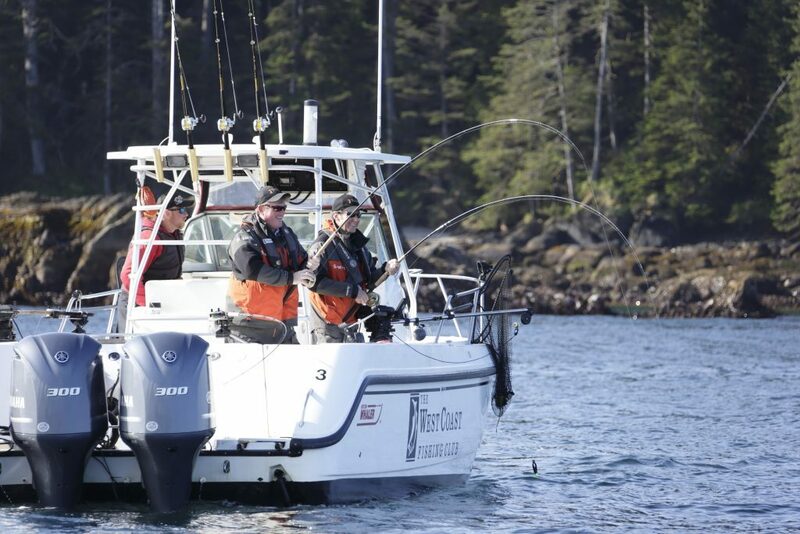 Next up on the special events calendar was the 11th annual Fishing for Kids Tournament, won by Glenn Fereday, whose 41.6 pound Tyee earned him a cheque for $200,000 which he promptly donated back, helping to net $820,000 for the Canucks Autism Network. After a temporary slowdown the bite seemed to pick up again near the end of the month and early September. Sure enough, as dawn broke on the final day of the year for North Island Lodge, Mark Hodge from The West Coast Fishing Club pulled his boat away from the dock with his son Jared and friend Don Fafard and motored off to Gunia Point where they closed out the season with an 18-pound Coho for Jared and a 42-pound caught and released Tyee for Don. A day or so later Adam Niles moved into first-place tie with Jared in the Coho category for 2016 with another 18-pound scrapper. 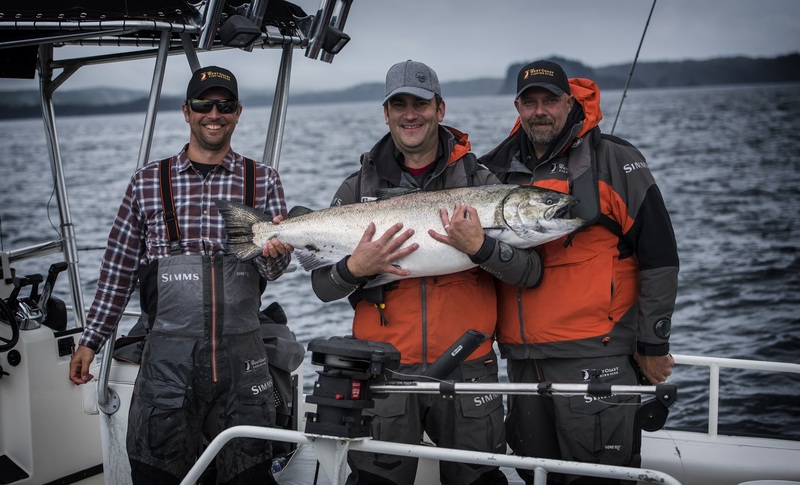 * Guide Kuiama St. Gelais, Glenn Fereday and John Klassen pose with the winning Tyee. 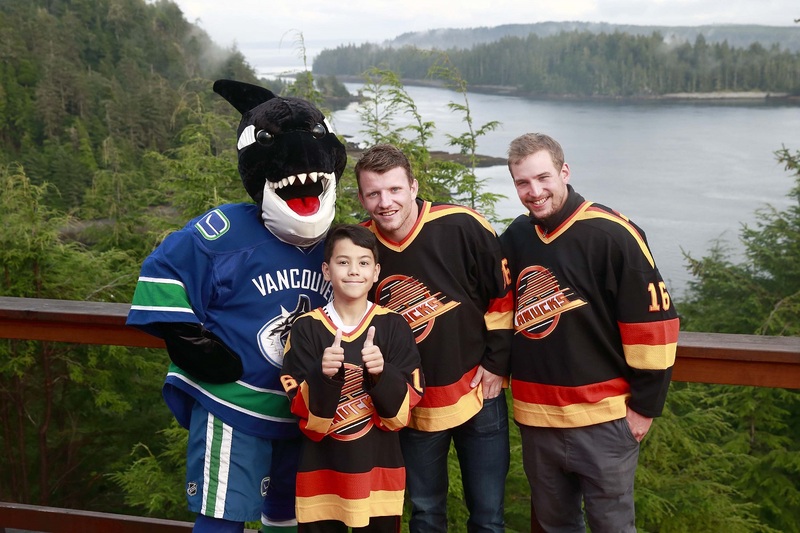 * Fin, Champion Child Brandon Carinha, Derek Dorsett, and Sven Baertschi on the back deck of The Clubhouse during Fishing for Kids. * Don Fafard and his 42lb Chinook on a fine September morning. 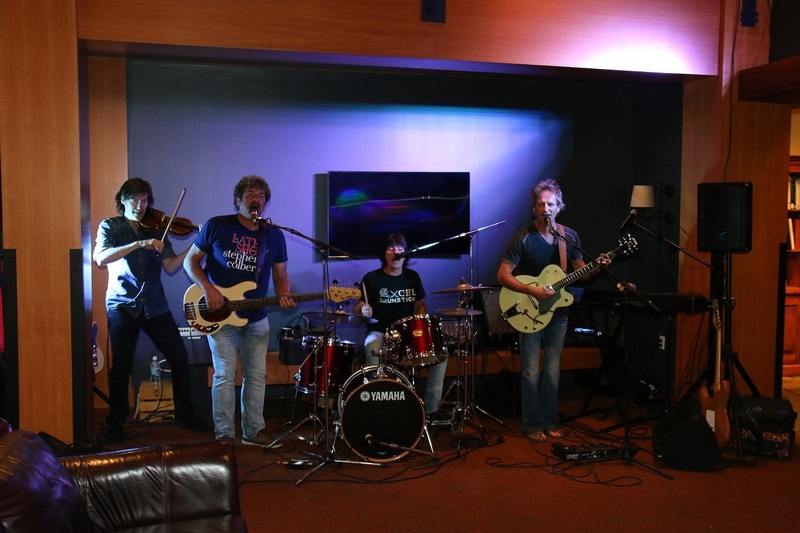 The last trip of the season featured live music courtesy of The Clubhouse’s own house band, The Dock Rockers. The final anglers of 2016 had to be patient at times in search of fish, but eventually almost everybody limited out on Salmon, including large Northern Coho that by now averaged north of 15 pounds. There were a few Tyees taken during the final week, the largest of which was a 31.5 for Darrell Gillan, followed by the very last Tyee of the season on September 10 – an even 30 – for Padraic Kelly. 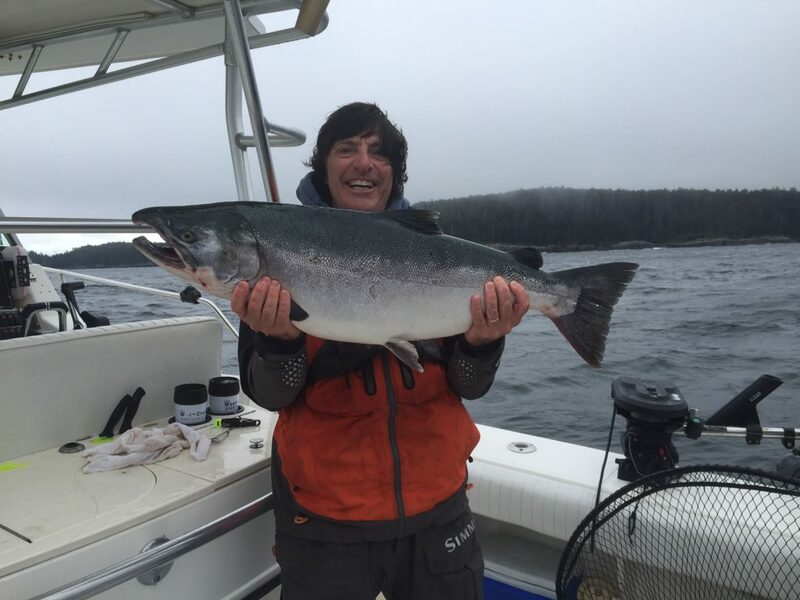 Not to be outdone, though, Dock Rockers drummer Marc LaFrance’s 19-pound Coho was the largest of the year for The West Coast Fishing Club. 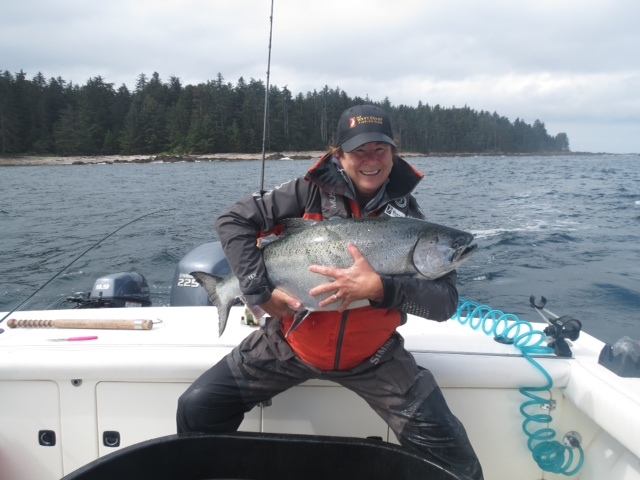 * Dyane Legge with a fine September Chinook. * Dock Rockers showing off their catch with guide Steve Tennant. 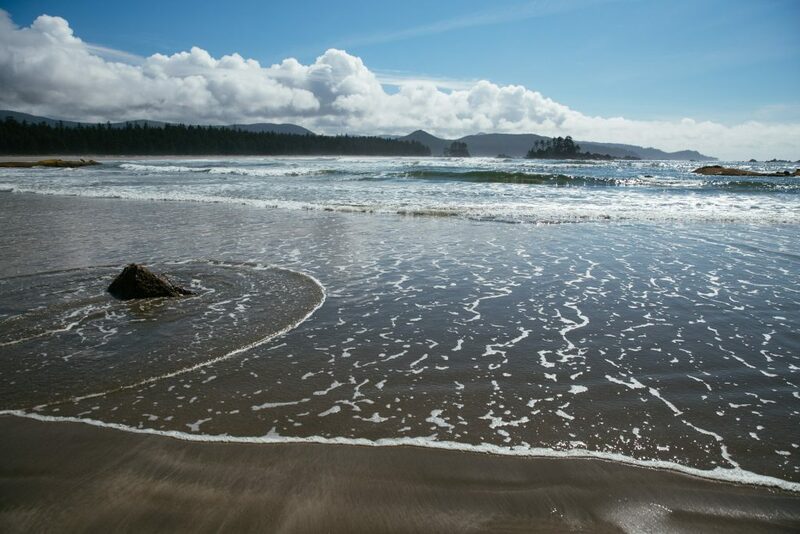 * Perfect Haida Gwaii September day. As the final choppers of the season lifted off, the seas were calm, skies were blue and Humpback whales fed voraciously on masses of baitfish that lingered. 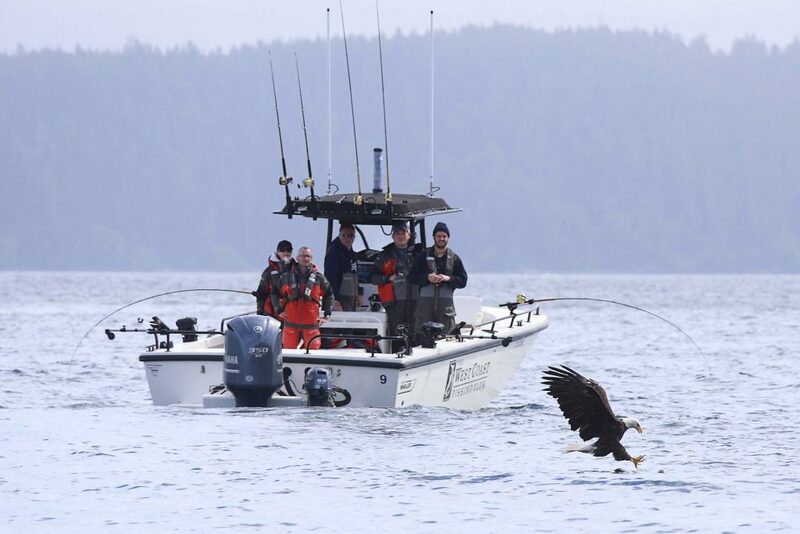 It was a fitting conclusion to another season of far beyond experiences in the marine wilderness of Haida Gwaii, courtesy of Mother Nature and The West Coast Fishing Club. * One last goodbye to The Clubhouse until the 2017 season. Don’t miss out on the 2017 season! Call us TODAY at 1-888-432-6666 or click here to fill out an inquiry online.